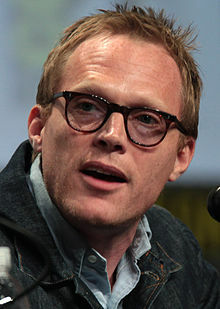 Paul Bettany (born May 27, 1971) is an English movie, voice, television, and stage actor. He voiced J.A.R.V.I.S. in the movies Iron Man, Iron Man 2 The Avengers, and Iron Man 3. He played the fictional character Vision in Avengers: Age of Ultron and Captain America: Civil War. Bettany was born in Shepherd's Bush, London, England. He has been married to Jennifer Connelly since 2003. They have three children. ↑ "Five Minutes With: Paul Bettany". BBC News. 17 November 2012. Retrieved 16 May 2013. ↑ "Paul Bettany biography site". Tiscali.co.uk. Retrieved 9 October 2010. Wikimedia Commons has media related to Paul Bettany. This page was last changed on 20 June 2018, at 03:20.